Based on the original book and concept of the same name by Peter Stone, the musical is a send-up of backstage murder mystery plots, set in 1959 Boston, Massachusetts and follows the fallout when Jessica Cranshaw, the untalented star of Robbin' Hood of the Old West is murdered during her opening night curtain call. The entire cast and crew are suspects. It is up to Lt. Frank Cioffi, a police detective with a nose for crime and an ear for musicwho moonlights as a musical theatre fan to save the show, solve the case, and maybe even find love before the show reopens, without getting killed himself. 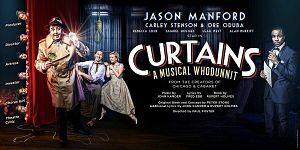 Directed by Paul Foster with choreography by Alistair Davis and musical supervision adn arrangement by Sarah Travis, Curtains will star Jason Manford (The Producers, Sweeney Todd, Chitty Chitty Bang Bang, Guys and Dolls). This hilarious whodunnit is packed full of catchy songs, great characters and plot twists galore. From the Tony Award-winning creators of Cabaret and Chicago, this backstage murder mystery musical has audiences laughing and guessing right to the final curtain. Jason will be joined by an all star cast to be announced.